Rumo is a Wolperting, although he doesn’t know it yet. His life begins lazily as a Hackonian farmer’s pet pup; spoiled and loved. His only responsibilities to accept belly rubs, the cooing of admirers, and occasionally come to understand the world around him. All is disrupted, though, when he and his caretakers are kidnapped by a carnivorous band of Demoncles who traversed the world on a floating rock, only coming to shore when the rock landed and their stores were depleted. This is where Rumo meets Smyke, a shark grub, and his life begins to pursue his real potential as the intelligent, upright walking, battle ready Wolperting he is. And this is just the beginning. Adventures (it’s in the title, after all) ensue for Rumo which lead him to the mysteriously blockaded town of Wolperting – a town filled with his own species, all of varying breeds, and a dome no one knows anything about. He gains a roommate, goes to school, learns to fence and play chess, to read and write, and becomes a master carpenter. Oh, and he falls in love. But when he returns from a lover’s mission outside the walls of town, he finds the bustling city vacant and an empty void where the dome once stood. Into the depths of Hell he wanders seeking his friends and teachers and the second half of Rumo’s life begins. Will he arrive in time to save them? You’ll have to read it to find out! 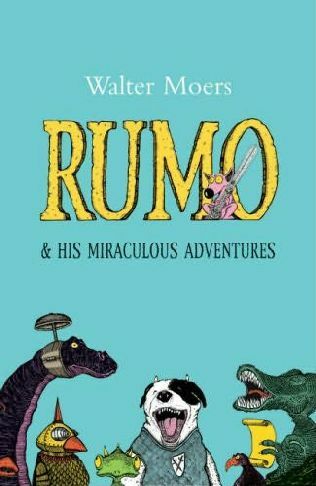 I bought Walter Moers’ Rumo in 2007 for $3.00 at Half Priced Books (my absolute favorite store on this planet.) The cover intrigued me and when I flipped through the pages which included character attributed fonts and original artwork by the author I was sold. I had never read fantasy fiction before, but I couldn’t resist. The presentation of the 689 page tomb was too creative to pass up. It’s a refreshing publication as it didn’t just tell a story from front cover to back, but rather it included the reader in the journey by playing with the traditions of published work. Art, font, black pages, text layout, and maps were constantly shifting so the eyes never grew tired or bored. The design of the book is just beautiful. Eight years later and I can still remember the moments I spent reading it. If I close my eyes I can see myself there laying on my stomach in our guest bedroom the door shut and the light filtering in through the closed blinds; sprawled out in the Arizona summer heat, lost in the world of Zamonia. Looking at my dogs with a sideways glance wondering when they would challenge me to a game of chess. My entire world came to a halt when I first started reading Rumo. I became useless to those around me and cared little for anything else – who needs food, right? It took me three days and two sleepless nights to finish. And then I was on the hunt for more. I purchased every English translated book he had and devoured them like a starving Demoncles. Although he has many books published in his native tongue, German, the English translations slowly trickle our way. I’ve even considered learning the language so I can have greater access to his work. In the meantime, I’ll continue to stalk Moers’ website and Amazon page for new releases and pre-release purchases. If I could give a six or seven or eight star review, I would. To see a strong sampling of Moers’ artwork, click here.